These pictures are so terrible; I shouldn't even show you. Really I shouldn't. You want to see them anyway? I thought you'd never ask. West had to bring a creative cake to his first pack meeting for cub scouts. Which means, or course, that I had to help him make this creative cake. Most weeks I'm barely surviving my own to-do list, so I wanted an easy way out. I begged him to choose an easy cake-a castle, a dragon, a clown, a puppy, a balloon. He thought my suggestions were about as cool as the Backstreet Boys in head to toe acid wash. He wanted something hip, sleek, and sure to impress. It had to be Star Wars light sabers. 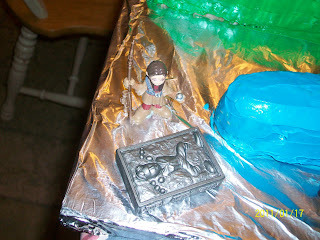 (He's been stuck on the idea since he saw his pictures of his friend Kimball's amazing cake in California.) I was still wondering how I was going to finish grading papers and scrub floors when a good idea took hold. 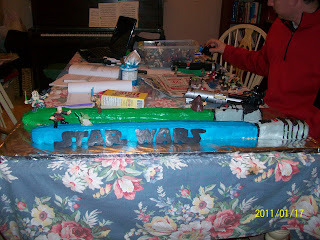 Why not mold a light saber out of rice krispy treats? West could make a batch of rice krispy treats in the microwave with his eyes closed. (He just wrote a how-to essay on how to do just that. With his eyes open.) With very little work, we had two light sabers that could snap, crackle and pop the life out of any Sith Lord. A little canned frosting (yeah, you heard me, canned frosting-you wanna make somethin' of it?) 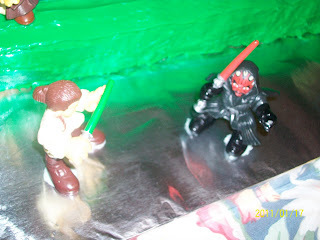 food coloring, and candy melts made the light sabers convincing enough to impress the Jedi council. We traced the Star Wars logo onto waxed paper and filled it in with melted black candy melts, then propped it up on the front of the light sabers. 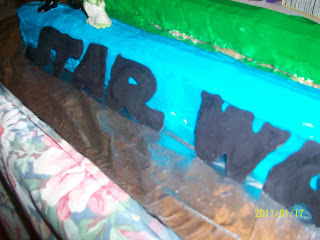 The finishing touch came from a few of his Star Wars figurines. Fabulous creation! 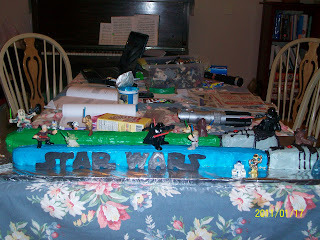 It looks like the force was with you.Thank goodness for Star Wars figures and canned frosting. Yall are one crative family! Way cute, Mr. West! Wow, very creative and impressive! 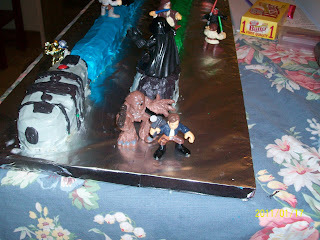 My husband is a Star Wars fanatic, looks like a great idea for a Father's Day cake or his next birthday! Good job! Bet it was a hit. Those are really good. I had to judge the Boy Scouts cake contest a few weeks ago and it was hilarious. One mom had two boys so she just tore one cake in half and each one of them dumped sprinkles on their half. I don't even think they cut it, just tore it. None of our cakes looked anything like that, except for the one one boy's mom made for him, which caused quite a stir amongst the other boys. Anyway, I also wanted to tell you that I am making Captain Crunch chicken tonight AND I have been researching and found that they ARE NOT discontinuing the brand. Phew! I need followers. Please follow my blog. I would appreciate it. Thanks and God bless you. I found several recipes for Butterbeer online that were very close to Universal Studios recipe. Thank goodness for Google!